Made in Sydney, New South Wales, Australia, 1938. Childs fancy dress costume comprising a dress and hat made of crepe paper. 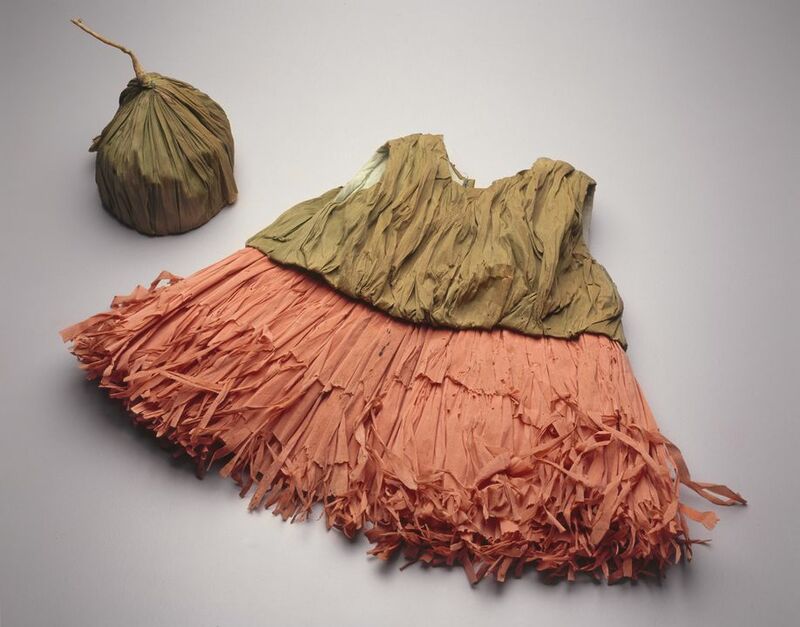 Dress: crepe paper costume with round neck, sleeveless and with opening down centre back. Bodice and upper skirt lined with pale green cotton. Hand stitched. Bodice is of eucalypt green crepe paper gathered into neck and waist. Skirt is multiple layers of pinky orange crepe paper gathered into waist. Hem of skirt is cut into long thin strips forming a fringe. Two metal press studs and two metal hooks and eyes form close at back. Hat: the hat is made from eucalypt green crepe paper forming a peaked hat in the shape of a gumnut with tightly twisted crepe paper forming a stem. Hand stitched and lined with the same crepe paper. This costume was made in Sydney, New South Wales, Australia. The costumes for the Public School Children's Festival were made by teachers and mothers. The donor remembers that her mother spent many days in working bees at Mosman Primary School making this and other costumes. The costume was worn by the donor, Pat Dale, in the 1938 Public School Children's Festival when she was 8 years old and kept by her mother and then herself until donated to the Museum. Her sister, whose costume does not survive, was Britannia. The Festival was performed twice, on April 6 and 7 1938, at 1.30 pm. MOTHERS MADE THE COSTUMES FROM CREPE PAPER AT WORKING BEES. The costume was worn by Pat Dale for her role as a gum blossom in the 'Garden of native flowers' section of the 1938 Public School Children's Festival for the sesquicentenary. This was held at the Sydney Cricket Ground on April 6 and 7 1938. The Festival programme described the event as aiming, 'by means of changing colour, rousing rhythyms, and pleasing pageantry to recall symbolically the people from whom we came, the land which drew us, our settlement and progress and a vision of world unity through co-operation. It is not a panoramic review of the historical incidents of the century and a half, but a children's jubilation, depicting in happy, joyous, dancing strains the spirit of our land and our national background.' The Festival was divided into a series of sections including 'Our land', 'Wheat', 'Wool', 'Garden of native flowers', 'Native animals' and the 'British Commonwealth of Nations' and, finally, 'Nations of the World'. 2016 children participated in the Garden section. Dressed as waratahs, flannel flowers, gum blossoms, wattle, Christmas bells and desert peas, the children formed 'dancing circles of movement'. An article in the Sydney Mail described the pageant as 'One of the most spectacular, beautiful and effective of the whole series of celebration pageants ... a palpitating spectacle of colour'. Significantly the native animals were all played by boys whilst the girls 'were rightly allotted the more picturesque and colourful roles of the flowers. Great ingenuity was shown in the making of the costumes'. Fancy dress is a way to lift the spirits especially in times of constraint. Crepe paper afforded a colourful and inexpensive way to enjoy acting out an alter ego and joining in a festive celebration. Unfortunately crepe paper had its downside. When wet the colour would run onto skin and clothing and leave nasty stains. The pageant committee thought long and hard about how to represent Australia. The Sydney Morning Herald 22/2/1938 reported committee discussions that led to the choice of two female figures to represent Australia. Other contenders were a surf lifesaver, a jackeroo and a farmer but it was thought these pushed sport and primary production too much. Director of Cinesound Ken Hall, thought choosing a young boy wrongly emphasised the 'infant nation' idea, which Australia had outgrown . Mr L.A.Robb president of the Returned Serviceman's League wanted an Anzac (Australia New Zealand Army Corps) 'I don't like the idea of a female symbol at all. It does not give enough strength' he said. An indigenous figure was not discussed.